Immunocal® supplementation in mice and rats previously exposed to potent carcinogens (cancer-causing agents) resulted in a remarkably lower tumor mass than in those animals supplemented with casein, standard feed, or meat. The above study was conducted with mice and rats exposed to (by feeding) potent carcinogens (cancer-causing agents). These animals were subsequently placed on protein diets of similar nutritional efficiency (Protein Efficiency Ratios, or PER), but from the three different protein sources. The COLON TUMOR MASS in animals fed the patented Whey Protein Concentrate (WPC) Immunocal® was LOWER than the tumor mass in animals fed casein protein, standard feed, or meat, suggesting a protective effect associated with Immunocal® supplementation. The immune stimulating effect of Immunocal® Patented WPC was significantly greater than that of commercial Whey Protein Concentrate and Casein Protein in a separate study conducted by Bounous et al in Canada. 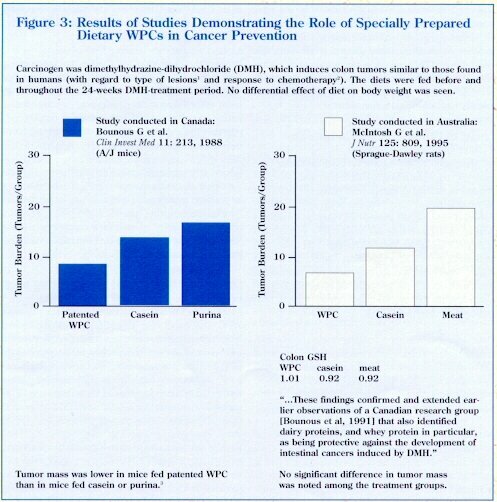 Additionally, the immunosustaining effect of Immunocal® Patented WPC was significantly greater than that of soy protein isolate in a study conducted by Bounous et al in Canada.